What better way to spend a weekend than going out to Frederick, MD and shooting stuff. Troop 51 will be camping at the Frederick Rifle Club. We will leave from Floris UMC at 5:00 PM and will return to Floris Elementary on Sunday at 4:00 PM. We will be participating in a service project, shotgun, rifle and archery. If you plan on shooting, you will need to ensure that you attend the Friday evening safety briefing. No briefing – No Shooting!!!! Come on out and join the fun – It’s always more fun with a gun! Troop 51 will embrace our winter months with a “campout” at Timberline Ski Resort. All of the scouts and adult leaders will be camping in Timberline’s bunk houses with real running water and plumbing – a big plus for camping. While at Timberline, all of our scouters will have to have a fun filled weekend of skiing and snowboarding. For those of us that are not experienced snow sportsman, there are opportunities for lessons. Make sure if you are attending to pack a lot of clothes and stay dry and warm while you are out there on the slopes. On the weekend of March 16 – 18, Troop 51 will host our annual New Scout campout at Elizabeth’s Furnace, near Strasbourg, VA. Assistant Scoutmaster Gilley will serve as our Grubmaster again this year and we are expecting to have the best camp food ever. Will we are at Elizabeth’s furnace, we take all of the scouts on a hike – our plan is to offer two routes, both 5 miles or longer, both helping our new scouts to meet one of their Tenderfoot requirements. We will also focus on many of the new scout skills that are required for various ranks, giving our new guys a big foot up going into Summer Camp. Why: We’ve selected this Northern Tier trip option, offered only at the Don Rogert Canoe Base in Ontario, because it is specially designed to maximize opportunities to fish!! 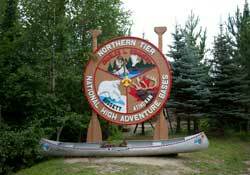 Northern Tier supplies all the fishing gear required. Each participant will have the opportunity to check out both a fly fishing and spin casting fishing pole, along with appropriate tackle and bait. In addition, we will be accompanied on the trip by a Fishing Interpreter, who will be a constant source of advice and tips for paddling and fishing the pristine waters of Ontario. Scouts – We have only 1 slot still available for this trip of a lifetime! If you love fishing and canoeing and will be age 14 by September 1st 2011, this could be your High Adventure trip. Itinerary: We will be taking two crews of Scouts into the Canadian wilderness to canoe and fish some of the best smallmouth bass lakes in the world. We will first fly to Thunder Bay, Ontario (via Toronto). Once in Ontario, our adventure will begin with a stay at Fort William, a historic recreation of a Voyageur fur trading fort and one of Canada’s top tourist attractions. On Sunday, June 24th, after our bus trip, we will check in at the Don Rogert Canoe Base in Atikokan. We will meet with our assigned guides, check out our equipment and get issued our food. We will have dinner and spend the night at the base. Monday: Master Angling Class that includes an introduction to fishing in Ontario along with techniques for fishing by canoe. After lunch, we will be transported to our put in location. Friday: Return to base. Check in equipment. Rendezvous Campfire Program. Saturday: Return bus trip to Thunder Bay. Fly home. If interested, please contact Mr. Fish for more details about costs and other requirements.